By no means is this an exhaustive list. And if you're an inexperienced camper, you should start slow. The only way to learn to camp is by experience -- and by experience, I mean mistakes and amusing stories of everything that went wrong. Whether you're looking into the kind of campsite you can drive to, a lean-to, or just a free space in the woods, know where the water is, whether you need to sanitize it (and how), or plan to bring your own. There's nothing worse than not having enough clean water. I've followed this rule religiously over the past ten years and it's never let me down. You may not know what you need them for yet, but believe me, you'll need them. Wet clothes, dirty dishes, keeping things dry in the rain, sap- or mud-covered gear, or just for trash and recyclables. Even if you're staying at a campground, bring extra -- they might run out, or you might need it on a hike or adventure in the wilderness. It's one of those things you forget how much you need until you don't have it. Even if the forecast tells you it'll only go down to 55 degrees at night, bring something warm to sleep in. It will likely feel colder than that in the woods and if you don't need the layers, you can use them as a pillow. It's good to rough it for a few days, but not to the point of self-harm or risk. Half a loaf of bread is not enough for three people for two days of camping. A book is not a suitable substitute for a pillow. And not bringing a map does not make you look smarter. Camp smart and bring the basic necessities. Just another one of those "you don't know what you need them for yet but you will" items. Sometimes you just can't wash your hands or shower. If you bring some sort of sanitary wipes, you'll feel just a little bit fresher and they won't take up much room or weight in your pack. No matter what the weather forecast says, be prepared for rain and cold. Bring a ground tarp to put under your tent in case of rain. Bring layers to wear. Bring a raincoat and shoes for all weather. You're friends may tease you for being over-prepared, but they won't be laughing when they're sleeping in a wet tent. You may have visions of a rousing evening of guitar and tales of times past, but if your neighbor has a 3 year old, they'll make sure that doesn't happen. 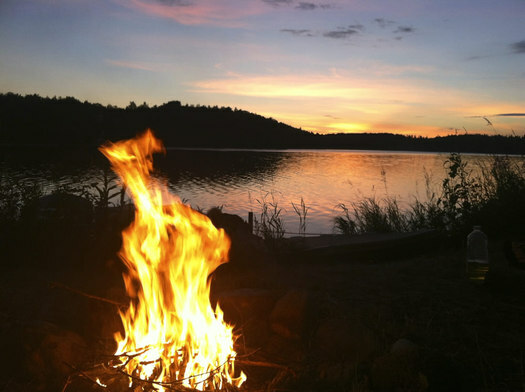 If you want to have a transcendently quiet night of Thoreau and a crackling fire, but your neighbors are 21 year-olds who brought more beer than food to their campsite, that's just not gonna happen. Maybe it's just me, but I hate getting up in the middle of the night in the middle of the woods to use the bathroom. No matter what the weather, I'd rather just stay in the safe cocoon of my little tent until morning comes. So road trip rules apply -- even if you don't think you have to go, try anyway. The joy of camping is returning to nature and living on just the basic needs for a few days. You have a fire because you need light and heat. You bring food that will actually nourish you. And you build a shelter because you're at the mercy of your surroundings. But that makes little treats all the more sweet. All of the sudden, a hot cup of delicious tea or hot cocoa tastes better than they ever have, and warm fuzzy socks seem like a resort-level luxury. Before I got to #6, I was going to recommend the same thing. We've gone years without wet wipes, but when our friends brought them this year, they made perfect sense. I'll disagree on one little point, and maybe it's a matter of wording: "Bring a ground tarp to put under your tent in case of rain." If you have a properly sized ground cloth that is just a bit smaller than the footprint of your tent, that's a good thing. If you have a big, impermeable tarp bigger than your tent that will collect water from all around the tent and soak your tent floor, that's a bad thing. I've seen many, many inexperienced campers basically create a tarpaulin bathtub in which their tents sit and soak up the rain. I'd also say: practice putting up your tent before you get there. You may have to do it in the rain. It's not fun, especially if you don't know how. #0 should be know the local rules. Know where you can and can't pitch your tent (literally and figuratively, I guess). Know what you should and shouldn't put in the water. Know how to store your food. Know where to park! A lot of it sounds like basic common sense but in the Adirondacks, for example, you can't camp within 150 feet of a road, trail, or water unless there's a yellow "camp here" disc. And in the Eastern High Peaks Zone open fires are not permitted and bear canisters are required. 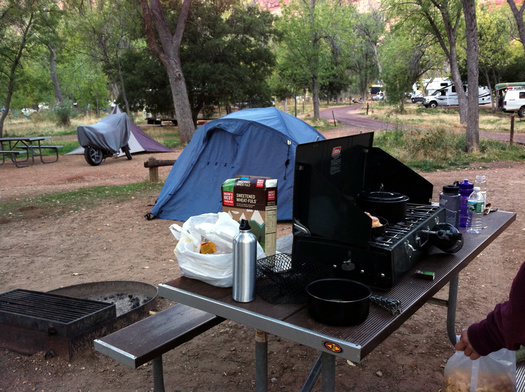 You'd be surprised at how many people who head to DEC/State Parks campgrounds without knowing they need a reservation! Basic do's and don'ts are great, and this is a fine list, but do a bit of research beforehand and get to know laws and regulations (the DEC website is a good place to start assuming you're headed for the ADKs/Catskills). Most importantly, enjoy the outdoors! But you probably won't have wifi. Call the park or District Ranger and find out about bugs. A long trip to Assateague Island or The Daks will be miserable if biting bugs are in season. That picture under #5 appears to be of a campground in a National Park out west. I'm guessing in Utah, maybe Zion or Capitol Reef. In any case, I'm pretty sure those red rocks behind the trees are not anywhere close to the Capital Region.